In May of this year, Jean Bertrand Gauthier became the 350th doctoral student at HEC Montréal to successfully defend his dissertation. This impressive total is evidence of the significant contribution by the School’s PhD program to educating high-level researchers in all management disciplines over the past 40 years. The PhD in Administration program is offered jointly by HEC Montréal and Concordia and McGill universities and the Université du Québec à Montréal (UQAM). It is the only program of its kind in North America, in view of its bilingual nature and its scope, and gives students access to a pool of some 400 professors, 260 of them at HEC Montréal. With 138 students out of a total of 441 enrolled in the joint program at the moment, HEC Montréal accounts for 31% of the PhD in Administration students in Montréal, 62% of them international students or permanent residents. The joint program can already boast just over 747 graduates, 350 of them from HEC Montréal, in one of the 10 program specializations. Nearly 75% of HEC Montréal PhD graduates hold professor-researcher positions (58% in Quebec, 18% elsewhere in Canada, 24% abroad). Most of the others are consultants, analysts or senior managers. Jean Bertrand Gauthier’s dissertation, in the field of operational research, supervised by Professor Jacques Desrosiers, is entitled Primal algorithms for degenerate linear and network flow problems. Operational research is a field of applied mathematics, and can be separated into two axes: modelling and resolution. Jean Bertrand’s dissertation focuses on resolution. In other words, given a so-called linear model, resolution is a way of finding an optimal solution to the model. Primal simplex is one of the best-known algorithms, appreciated for both its simplicity and its great practical efficiency, but unfortunately it must be adjusted for degeneracy. This drawback reduces the usefulness of the resolution process by performing calculations that lead to no improvement. Mr. Gauthier first of all examined network problems, so as to better understand degeneracy and find new resolution tools. He reviewed several algorithms, some well known and others less so, such as dynamic constraint aggregation, minimum mean cycle-cancelling and improved primal simplex – and suggested a new mechanism that combines them all, through the selection of a single parameter. To conclude, he identified an entire family of algorithms guaranteed to lead to improvements, if there are any. One of the major benefits of his dissertation will be a faster method for generating columns, widely used to resolve highly complex models in transportation, especially air transportation. 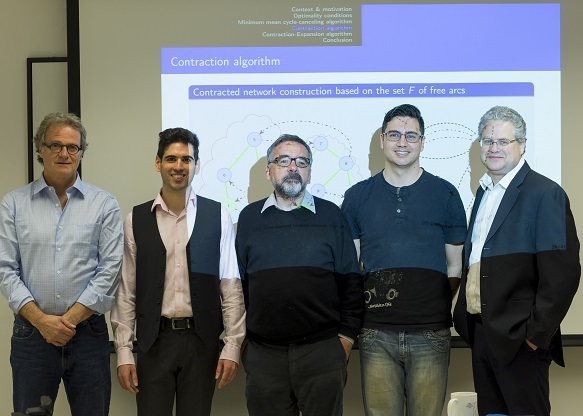 In addition to his dissertation director Jacques Desrosiers, the jury consisted of Professors Gilbert Laporte (Chair/rapporteur), Claudio Contardo of ESG UQAM (jury member) and Stefan Irnich of the Johannes Gutenberg University Mainz (external examiner). The PhD Program Director, Jacques Robert, representing the HEC Montréal Director, was also present. All the jury members praised the candidate’s remarkable work and unanimously recommended that his dissertation be considered for the School’s award for the best dissertation. Jacques Desrosiers, Jean Bertrand Gauthier, Gilbert Laporte, Claudio Contardo and Jacques Robert.